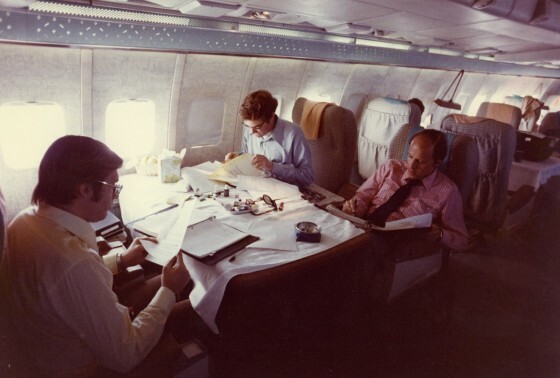 John Negroponte, pictured on the far right, prepares briefing material for Henry Kissinger en route to Paris for the peace signings. The year 1970 saw President Nixon make some profound decisions regarding United States operations in Vietnam in addition to some real progress in negotiations. Secret bilateral negotiations between Kissinger and Hanoi’s chief negotiator Le Duc Tho began early in the year, yet intelligence reports were indicating that Communist infiltration from North to South Vietnam was increasing substantially. Likewise, the North Vietnamese were beginning to move large caches of equipment and weapons into their Cambodian sanctuaries. All indications pointed to an imminent and concerted North Vietnamese (NVA) assault upon South Vietnam (SVN). However, the buildup did not persuade to continue his Vietnamization plan. On April 20, 1970, President Nixon announced the withdrawal of 150,000 additional American troops to be completed within a year’s time. Ten days later, President Nixon ordered the joint US/ARVN assault on Cambodian Communist sanctuaries, one of the most successful offensive operations of the entire war. Following this success and an indication that Hanoi was seriously considering U.S. proposals during peace talks, it appeared that the turmoil of the late 1960s was turning to hope. However, the South Vietnamese presidential elections were quickly approaching and the sustained strength of a stable South Vietnamese government was far from certain. One who had served ten years in the foreign service and dedicated a majority of that time as a provincial specialist in Vietnam, John Dimitri Negroponte was brought onto Kissinger’s NSC staff for his experience in Indochina affairs. He acquired immense expertise as a result of his time analyzing the political situation as a provincial reporting official in South Vietnam following the deposition of Ngo Dinh Diem in 1963 and later with his involvement in the Paris peace talks of 1968. Negroponte understood the dangers associated with a volatile South Vietnamese government and the residual effect it had on the South Vietnamese countryside, an area highly vulnerable to the Viet Cong political apparatus. Negroponte outlined three different ways he believed things in South Vietnam could quickly unravel. He cited the dangers of a political crisis in South Vietnam coinciding with presidential elections, the prospects of military setbacks in I and II Corps in the northern South Vietnamese regions, and an overextension of South Vietnamese governmental resources in Cambodia. -Stability of GVN is essential to Vietnamization, and therefore support for Thieu, upon his likely decision to run, is highly advantageous. -Play the situation as a “temporary setback” to Vietnamization, which would not delay long-range plans. -No change in the present diplomatic position, because irrespective of internal situation in GVN, Communist insistence on negotiating away the GVN’s existence is a constant. -Citing, again, a “temporary setback” to Vietnamization, recalling past GVN recoveries from even more substantial NVA/VC pushes such as the Tet Offensive. -Continue redeployments while lifting some operational constraints of remaining combat forces, altering the ratio of remaining combat to support troops, or a brief bombing campaign. -The alternative option of stopping redeployments, which would be welcomed by the GVN and would frustrate Hanoi, would incite rath at home. -In the case of this “temporary setback,” on the diplomatic front urge the GVN to be more forthcoming on internal political matters while maintaining a firm stand on military issues. Warn Hanoi of the futility and risks involved in increasing application of force. -Stress Hanoi’s responsibility for widening the war, citing GVN’s intervention as evidence of regional effort. -Military efforts would be similar to contingency B–the difference being that the GVN would seek to sharply reduce its commitments in Cambodia and that the U.S. would be faced with either saving Cambodia unilaterally with Thai assistance or to beef up military support for affected areas in SVN to retain RVNAF forces in Cambodia. With Negroponte’s contingency options, Kissinger began 1971 well prepared for his uphill negotiating battle with the North Vietnamese.